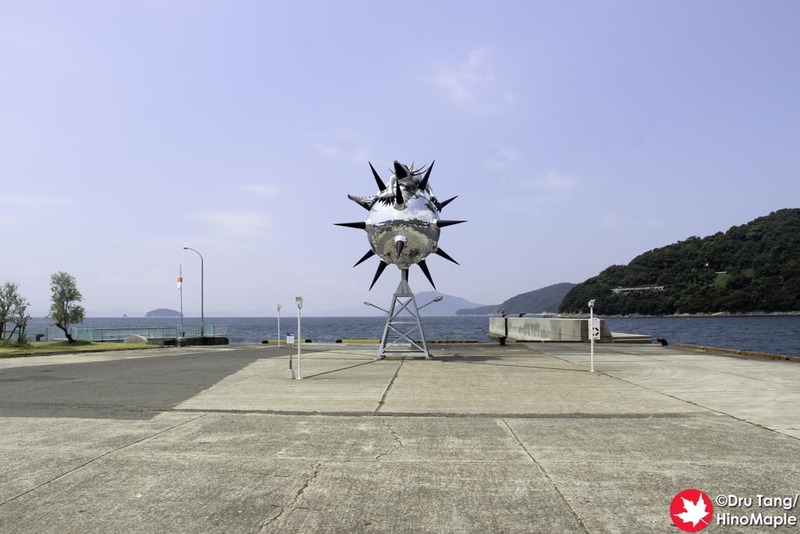 THE STAR ANGER by Kenji Yanobe is actually an artwork that needs to be considered as an accompaniment with Beat Shrine/ANGER from the Bottom. The Star Anger is a really cool artwork and I really loved it. 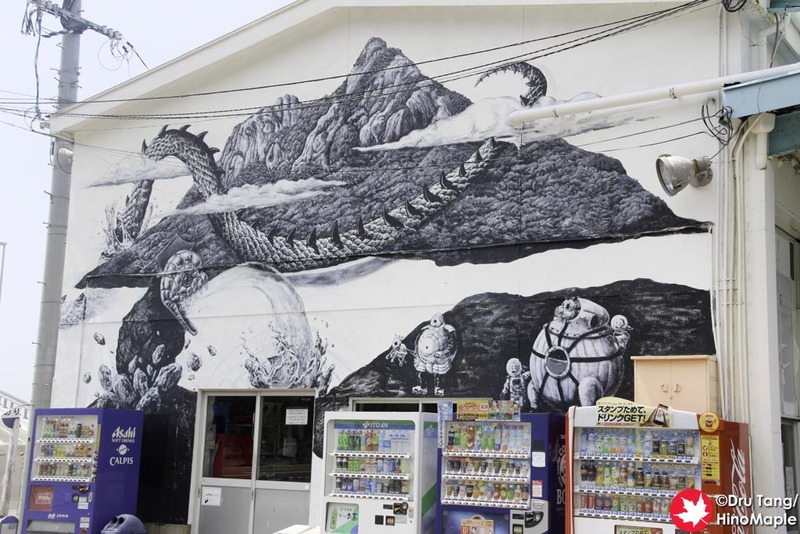 It was an artwork that was high on my list of things to see on Shodoshima and I was really happy I made the trip to Sakate port to enjoy it. 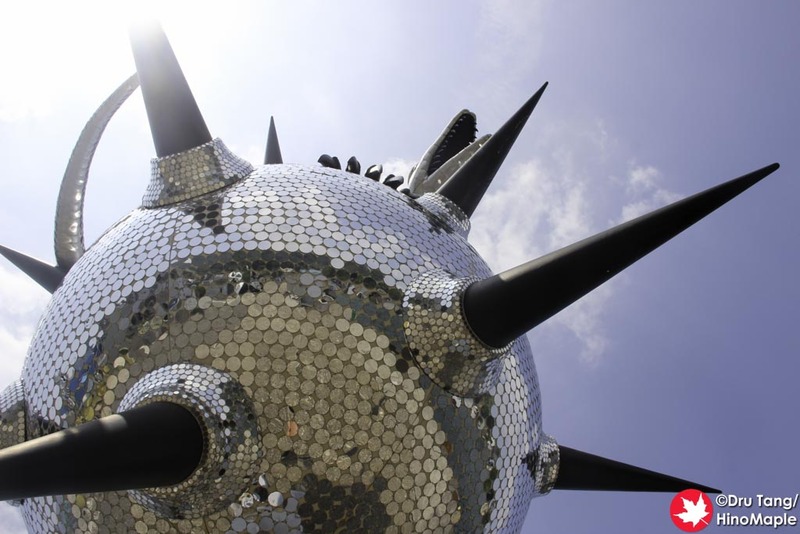 The Star Anger is a real simple disco ball with a dragon on it that is constantly spinning. Come to think of it, it really isn’t simple at all but the basic concept is simple. 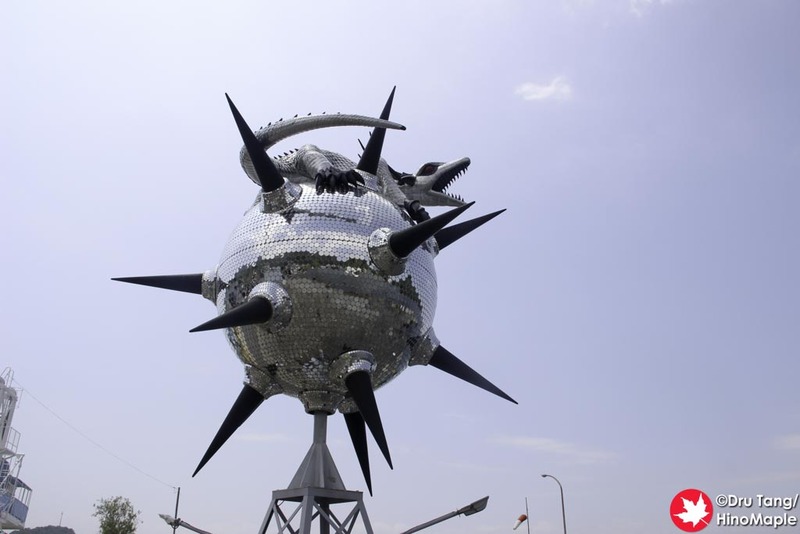 Once you see the disco ball with all of its spikes protruding from the ball you can see where the star comes from. 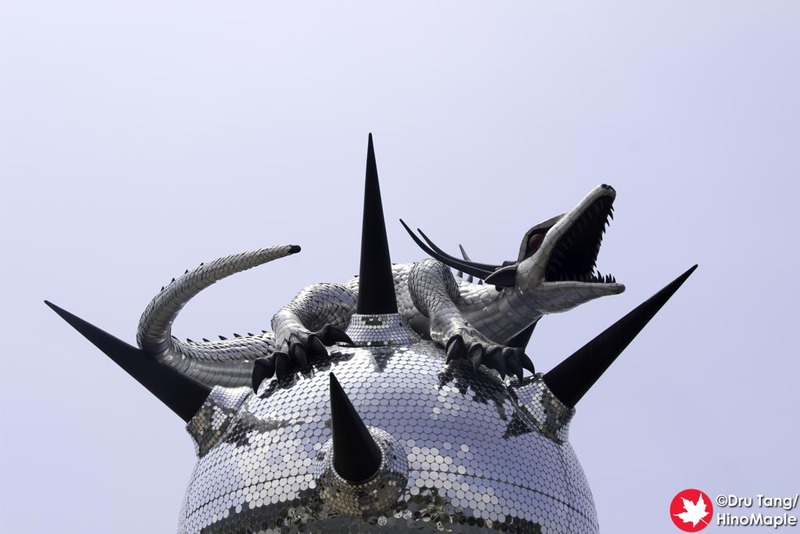 The anger part comes from the dragon perched atop of the disco ball. 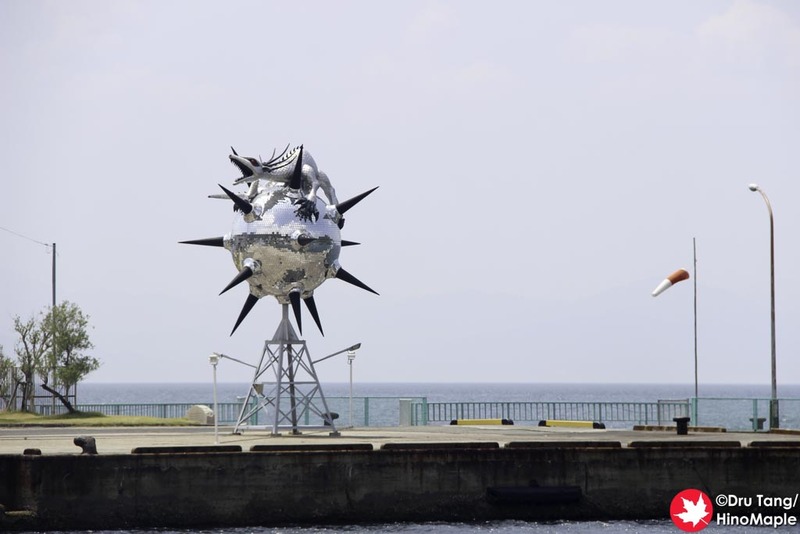 Seeing the Star Anger at Sakate port was really amazing. I entered Sakate port from the main road and you come down a small hill and into the port. If you take time to look out from the top of the hill you can really see how the Star Anger is a beacon to the port itself. 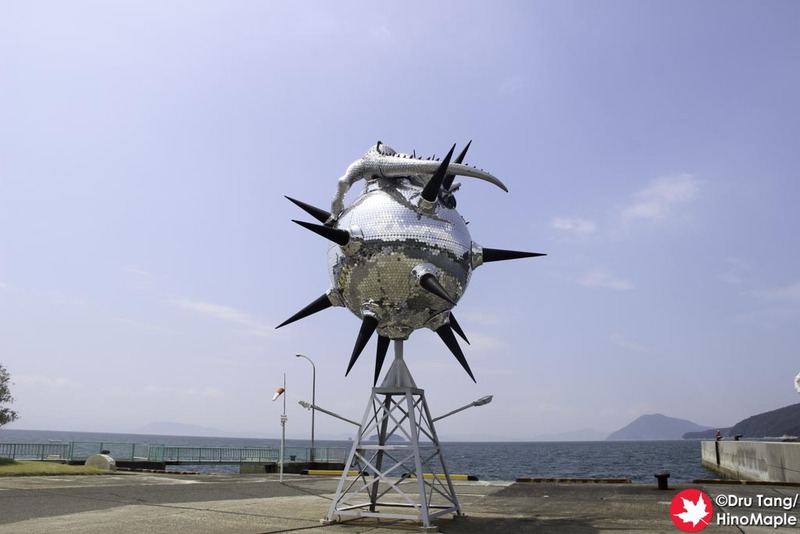 While the Star Anger is the main attraction, you really have to look at the port building just behind the Star Anger. 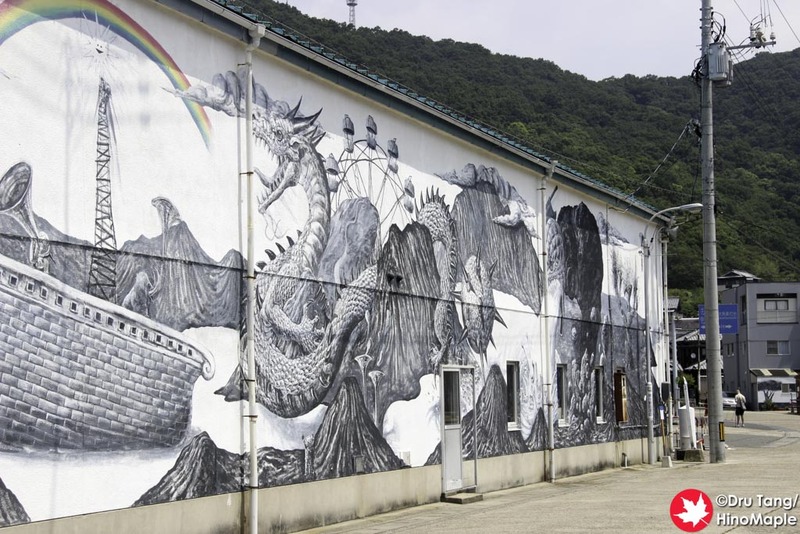 I believe Kenji Yanobe also created this artwork which is a huge painting on the side of the building that appears to tell the story of the Star Anger and Anger from the Bottom. 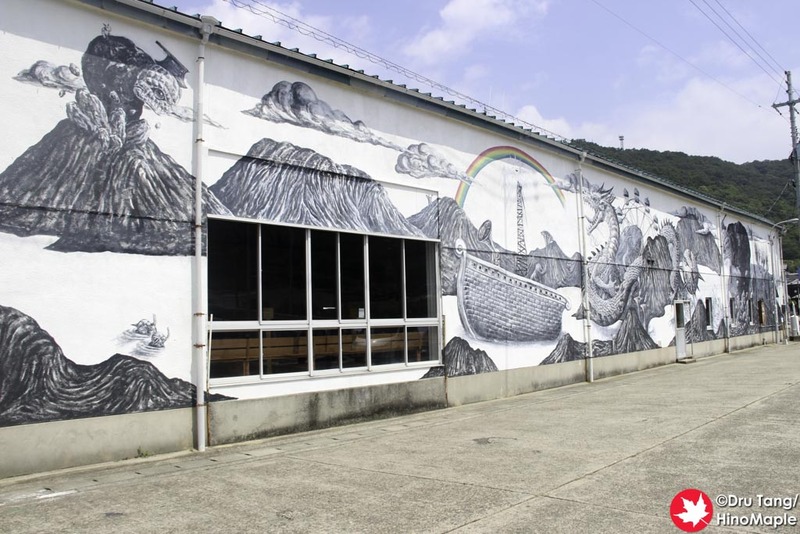 It was an amazing mural and you can see some of the ideas that came from this combined artwork. 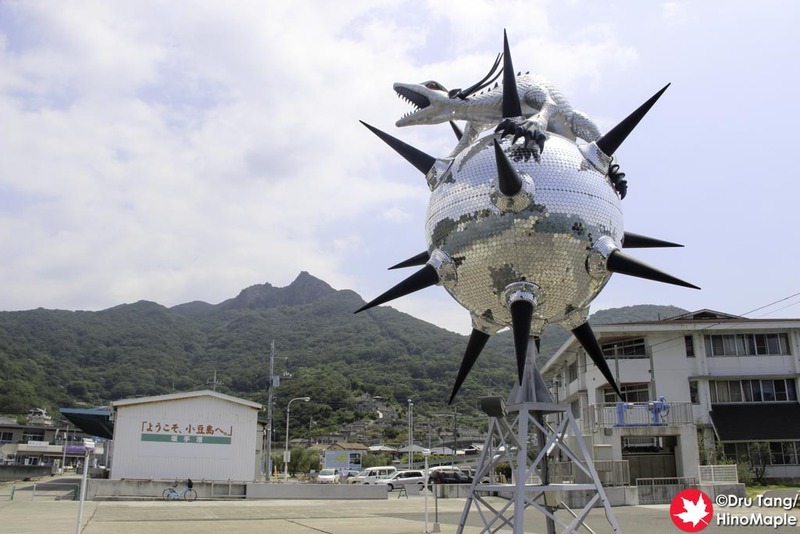 This entry was posted in Setouchi Triennale and tagged 2016 Setouchi Triennale, japan, Kenji Yanobe, Sakate, Shodoshima, THE STAR ANGER by Dru. Bookmark the permalink. I love this artwork, and yes, Star Anger and Anger from the Bottom work together as you mentioned. I tend to consider the large mural as part of Star Anger, but yes, it’s really more a link between both works. As often with Yanobe’s art, I feel like it’s some sort of “side product” or rather paraphernalia of some narratives (books? movies? comics?) that I have missed. I guess that’s our job to recreate it in our mind. Or maybe they do exist. Maybe there is a single copy of the story of Star Anger and Anger from the Bottom (I have to assume that they’re the antagonists) somewhere in Yanobe’s house. 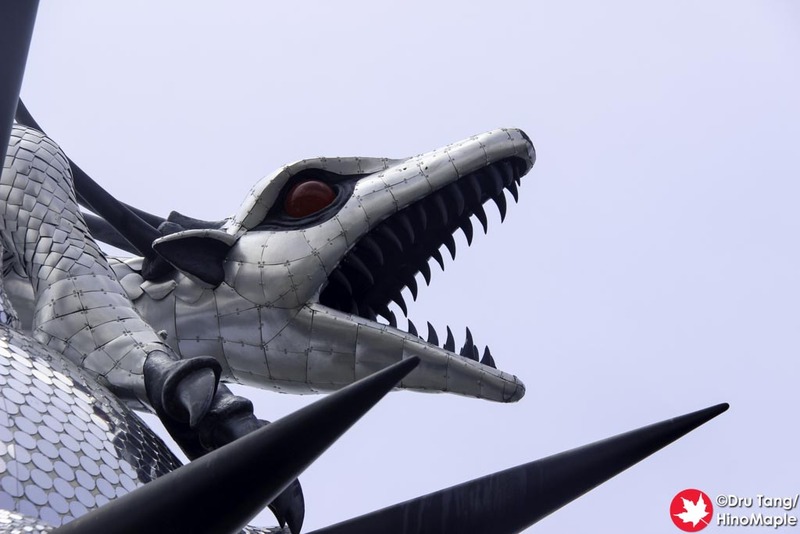 You know there’s a third part to the artwork (not sure if it’s still around), right? The yellow spaceman (I guess he is the protagonist). 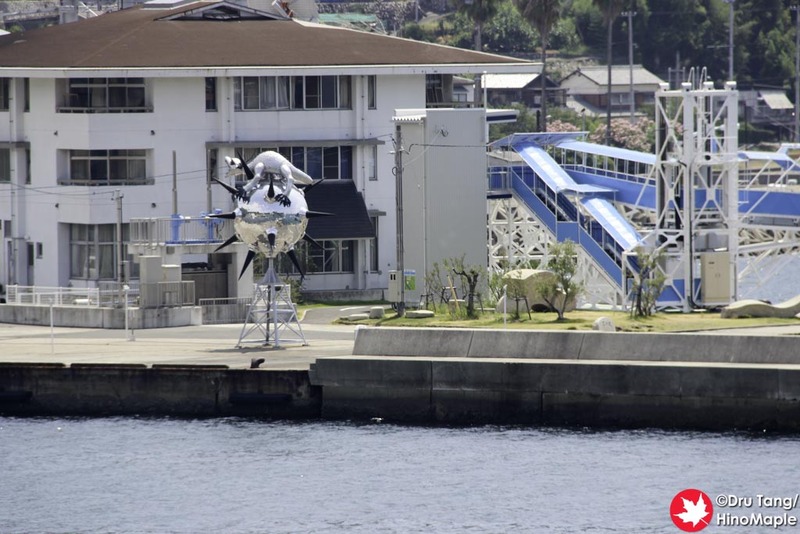 He’s on the Kobe-Sakate-Takamatsu ferry. I have never seen him, only pictures. I would love to see if Yanobe has his own story about these creatures and about the background of the artwork. It is always like a story with him. I don’t think I know about the 3rd part. I might have heard about it from you, or maybe (if my memory is correct), I saw the yellow spaceman at the terminal building. Or was it the community building. Working off my memory right now. I remember seeing some weird space based board that you can put your head through and take a photo. I’ll have to dig up my old photos and see if I can put it here later. 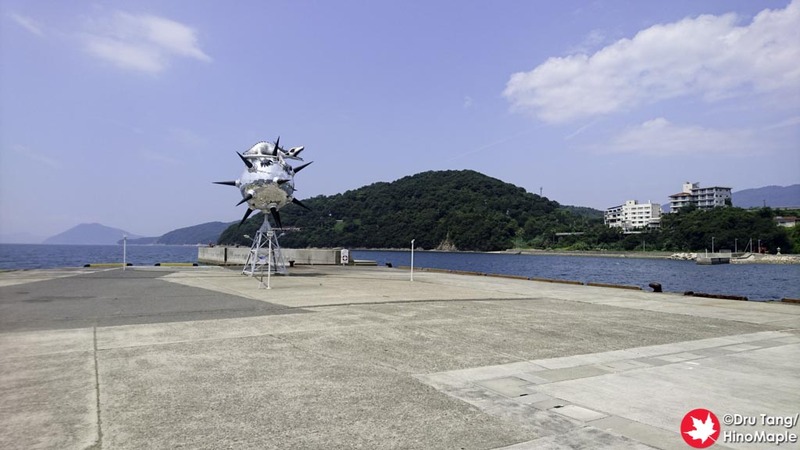 There are drawings and such of the spaceman in several places in Sakate (I guess he has become the informal mascot – I would have voted for the Anger from the Bottom personally), but there is/was a large statue on the ferry (not the one going to Sunport).